Learn lots of new cool rock and metal guitar licks, and more importantly, learn how to use them in ANY song, solo or improvisation. If You Are Not An Advanced Guitar Player Yet, Click Here! Have you ever heard another guitar player play something really cool in a guitar solo and think, "That guitar lick was awesome! I'd love to use a similar lick in one of my songs or guitar solos, but I'm not sure how to do it!"? Do you struggle to create your own cool guitar solos and improvisations? Does it frustrate you to the point where you think, "I'm just not as creative as my favorite guitar players are"? 1. Not having enough cool guitar licks to use. 2. Not knowing how to use the ideas you do have and make them fit into any solo or song you are trying to create. If either of the 2 things above describes you, then I know exactly how you feel. For many years I would learn to play some cool rock or metal guitar licks, but could not seem to make them fit well into my own songs and guitar solos. 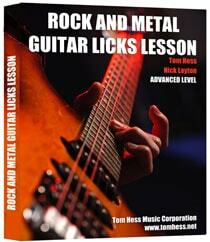 Like you probably have done, I simply tried to learn more guitar licks. I thought, the more licks I know, the easier it will be for me to create my own guitar solos. 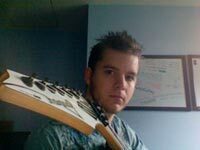 The problem was the books, videos and teachers I was learning from never really helped me to take a guitar lick from one key, song, tempo and rhythm and use it in a totally different type of song or solo. Now, many years later, although you can learn guitar licks anywhere, what is extremely hard to find is a course that will teach you both new cool rock or metal guitar licks AND how to use them in any song! After all, if you can't freely use the guitar licks you have learned, then they are all pretty much useless, aren't they? In order to change this and help you become a ‘more complete’ musician, Nick Layton and I have put all our experience together and developed the Rock And Metal Guitar Licks Lesson Course. It will take you beyond just learning licks and teaches you how to apply them to any song or guitar solo you wish to create. 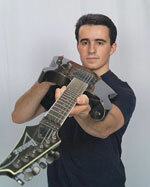 You will learn many new killer rock and metal guitar licks. You will get many detailed explanations about how to use each guitar lick in a wide variety of different types of guitar solos and songs. You will get 10 cool jam tracks so that you can immediately apply each new guitar lick to 10 totally different types of songs. You will get highly innovative training that you cannot find anywhere else. All of this gives you 200 short, easy to understand rock and metal guitar licks lessons, examples and ways to apply them. You can begin to use these innovative ideas in your guitar playing right away. Whether I’m soloing over an intense heavy metal riff or playing over a mellow acoustic tune, having the ability to INSTANTLY and seamlessly adapt my vocabulary of licks to fit the music made me a much more creative soloist. I’ve studied many books about playing lead guitar but have not seen another course that helped me to open up such a huge number of creative options for my guitar playing! What we do for you is show you many cool new rock and metal guitar licks. Then we give you 10 different types of songs (jam tracks) to play each lick over, PLUS we teach you exactly how you need to slightly modify some aspects of the lick so that it will fit 'musically' into the different keys, rhythms, tempos, and styles. This unique training will enable you not only to use the cool guitar licks we give you, but more importantly, it gives you the tools, skills, and knowledge to instantly take any guitar lick and use it in a wide variety of songs. You can even use the jam tracks we give you to practice other licks that you already know in the same way. This Rock And Metal Guitar Licks Lesson Course is perfect for you if you are an intermediate or advanced skill level guitarist who wants to learn more great rock and metal guitar licks AND you want to USE them in any musical situation when soloing, improvising or composing. Not only does this course provide licks and backing tracks, the real benefit is in the explanation on use and implementation for each lick on several backing tracks. I've never seen a course that describes in detail the various ways you can use and alter each lick to really make it your own. The course includes 10 great backing tracks to test out your ideas and jam along with. It has changed my approach to soloing. I am much more confident in my ability to apply the licks I know to different musical contexts. I highly recommend this course if you are a guitarist who knows a ton of licks but is having trouble applying them to real playing situations.